A city of culture, grand architecture and fantastic food, Florence is an Italian city that offers so much to see, do and discover. 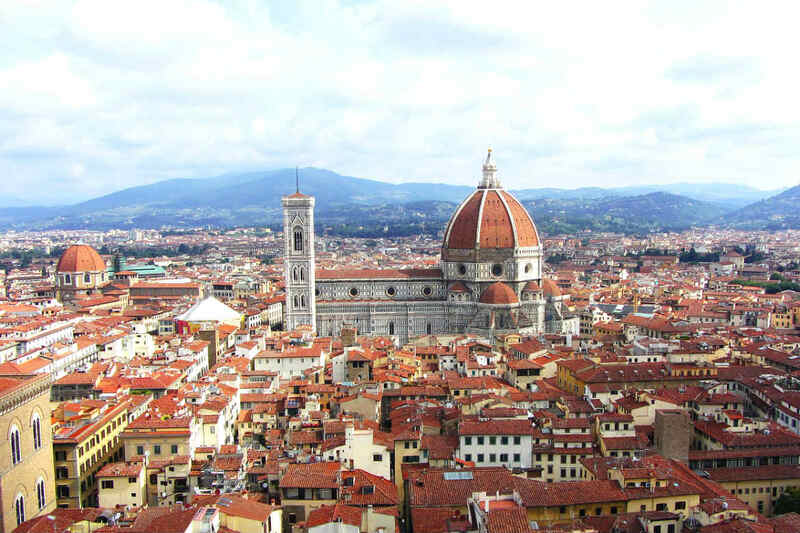 If you’re planning a trip to the Tuscan capital, be sure to check out some of the top things to do in Florence, from its incredible art galleries and fantastic monuments through to popular local markets. Uffuzi Gallery, Florence, Italy. Image Credit: Larry Lamsa / CC by 2.0. Said to be one of the largest and best known Italian art museums, the Uffizi Gallery has earned a reputation in the art world for its fine collection of sculptures and paintings, with works originating from ancient times through to the 20th century. Alongside paintings by Rembrandt, Botticelli, Raffaello and Michelangelo, you’ll find sculptures, prints and drawings by some of the best creative minds the world has ever seen. Be sure to check out The Birth of Venus by Botticelli and The Holy Family by Michelangelo, and keep an eye out for the beautiful frescoed ceilings scattered throughout the building. David at the Galleria dell’Accademia, Florence, Italy. Image Credit: Dimitris Kamaras / CC by 2.0. Another of Florence’s wonderful art galleries, the Galleria dell’Accademia is perhaps best known as the home of Michelangelo’s David, a spectacular marble sculpture depicting the biblical figure of the same name. 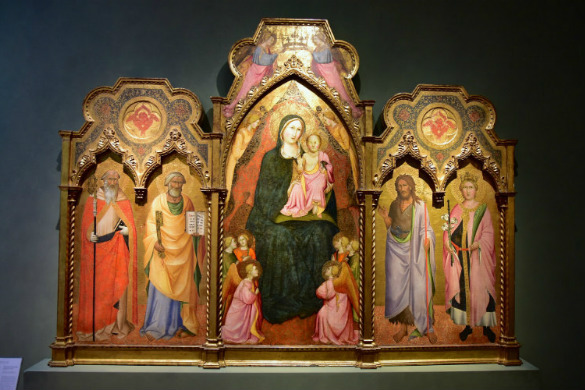 Smaller than the Uffizi Gallery, the collection of the Galleria dell’Accademia is considered to be more specialised, featuring an assortment of sculptures and paintings, as well as musical instruments from the Grand Ducal and Medici collections. 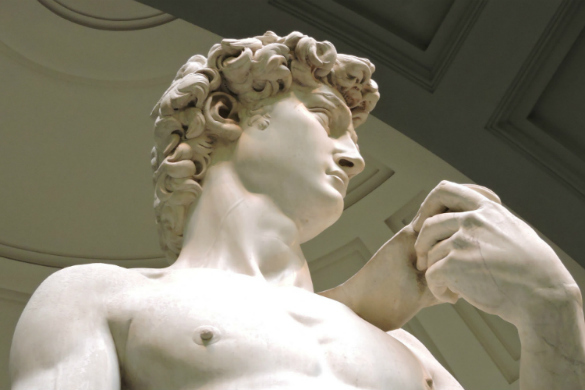 Be sure to look beyond Michelangelo’s iconic sculpture and explore the gallery’s two levels, where you’ll encounter the diversity and beauty of art from across Florence and wider Europe. Duomo di Firenze, Florence, Italy. 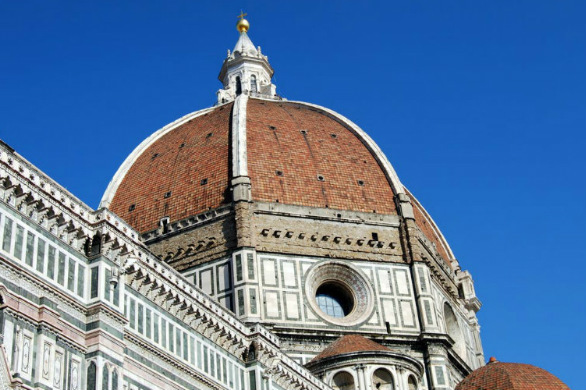 Thought to be one of the largest churches in Italy, Florence’s Duomo di Firenze, often simply referred to as the Duomo, is a true Florentine icon. With its red tiled dome standing tall above the surrounding neighbourhoods, construction of the ornate cathedral started in the late 13th century, with the final details and decorations added to the facade during the 19th century. Entry to the spectacular building is free, with reservations required to make the journey to the top of the dome – a spot where you’ll enjoy incredible views of the city and its surrounds. View from Piazzale Michelangelo, Florence, Italy. Image Credit: brando / CC by 2.0. 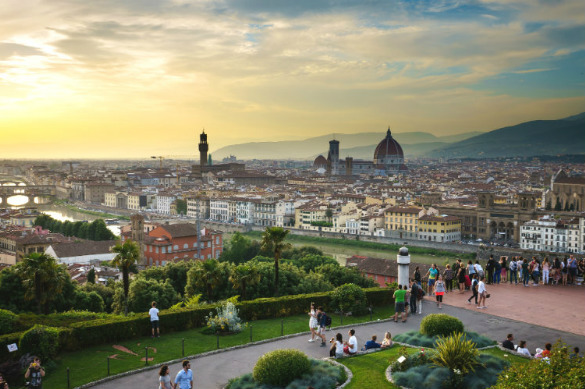 Another great spot to soak up the city’s sights, Piazzale Michelangelo, dedicated to one of the city’s most famous artists, Michelangelo, offers beautiful postcard-perfect views across Florence and its surrounds. Forget the souvenir stalls filled with cheap David related wares that line the square, it’s the unbeatable views from this vantage point that are sure to leave you in awe of the city. Admire popular landmarks, such as the Duomo, the Basilica di Santa Croce and Palazzo Vecchio, embrace the unrivalled photo opportunities, or simply take a moment or two to fully comprehend the beauty of this historic Italian city. Campanile di Giotto, Florence, Italy. Image Credit: sailko / CC by SA 3.0. Another of Florence’s unmissable attractions, the 14th century Campanile di Giotto is found in Piazza del Duomo, next to Duomo di Firenze. 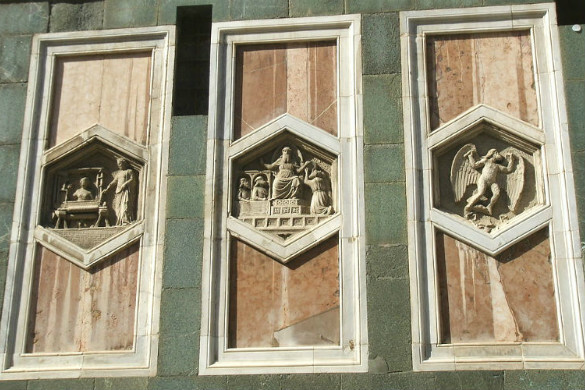 A free standing bell tower clad in the same coloured marble as the neighbouring cathedral, the campanile is adorned with intricately carved reliefs, statues of religious figures and pleasing symmetrical decorations. 414 steps lead to the bell tower’s highest point, with its upper level offering fantastic views of the city. From around 80 metres above street level, you’ll have the chance to admire the spectacular scale and beauty of the Duomo’s domed roof up close and from a unique angle. Mercato Centrale, Florence, Italy. Image Credit: stevekc / CC by 2.0. A great place to head if you’re wanting to try out some flavoursome local fare, Mercato Centrale (the central market) features stalls filled with fresh produce, cheeses, meats and fish. Wind your way through the maze of stalls, chat with the locals and find all the ingredients needed to whip up your own authentic Tuscan feast. If you’d rather leave the cooking to the experts, head upstairs to the contemporary food hall and check out the tasting stands, food outlets and onsite cooking school. Try tantalising local favourites, learn from some of the best in the business or get some inspiration for your next dinner party. 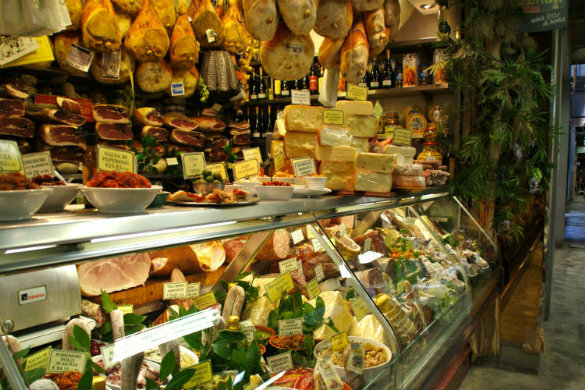 One of the best parts of travelling is the opportunity to sample the local cuisine, and Florence certainly isn’t an exception to this rule. Alongside delicious meat and pasta dishes, you’ll find one of Italy’s most famous and delicious foods, gelato. 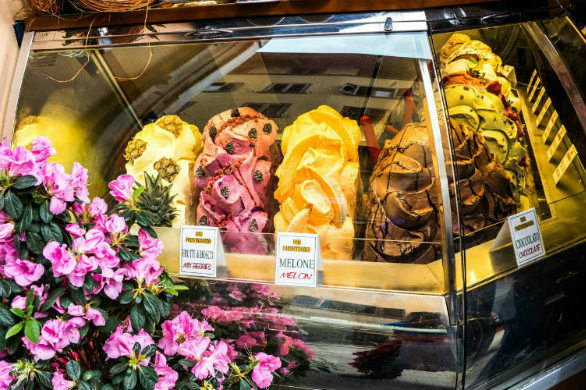 Scope out some of the city’s favourite gelato shops and sample some of Florence’s original flavours and varieties. Creamy and filled with quality ingredients, you can’t go wrong with a scoop or two of authentic Florentine gelato, especially on a warm Italian summer’s day. Where? You’ll find vendors across the city. Ready to set out on your own Italian adventure? Secure your place on an unforgettable Europe tour from Webjet Exclusives today!